Ceremony Rings in set of 2: Diamond engagement ring in cluster solitaire-esque style surrounded by a single row of diamonds in a channel setting crafted in 18 karat white gold, accompanied by an attractive matching diamond channel set wedding band. 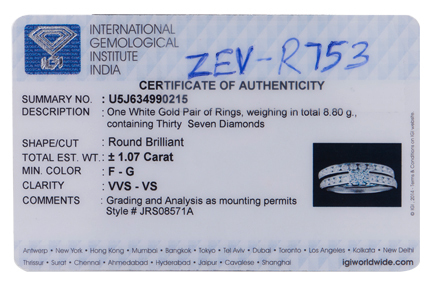 Diamond clarity: VVS-VS | Color: F-G | Total weight: 1.07 carats containing 37 round brilliant diamonds. The measurements of the engagement ring center stone is 5 mm long x 5 mm wide and maximum band width is 2 mm. The wedding band maximum band is 2.5 mm.